Greenwich's Zane Nye competes in the 55 meter dash during FCIAC Track Championship action in New Haven, Conn., on Thursday Jan. 31, 2019. The Hatters dominated en route to their sixth straight FCIAC indoor title at the Floyd Little Athletic Center, scoring 112 points to leave no doubt who the top team in the league was. Staples was second (55), McMahon was third (48) and Ludlowe was fourth (42). “The boys really outperformed what I thought they would do,” said Hatters coach Rob Murray. “Coming off last week at the divisionals where we didn’t execute in a few events. Today, every guy stepped up in every event and really just set a strong tone right from the first event to the 15th event. Danbury placed a performer in the top two in 10 of 15 events. The Hatters scored points in virtually every event, including winning the 4×4 to cap the meet. Danbury went 2-3 in the 55 hurdles with Alexander Beiku and Shay Fahsbender and Malik Thomas finished third in the 55 dash. McMahon standout Justin Forde won the long jump and placed second behind Staples’ Chet Ellis in the high jump (6-06) in what’s the first of several big meets for the senior. Competing in his first indoor season, Forde set a meet record in winning the long jump with a leap of 23-04. Forde — who is headed to the University of Miami — cleared 6-10 at Hillhouse in December for a new PR, but Ellis had the final say Thursday. Forde’s teammate Korey Morton broke a meet record in winning the 55 dash in 6.47 seconds. Forde owns the No. 1 triple jump in the country, an event not at FCIACs. Danbury started the meet with a pair of runner-up finishes in the 4×200 and 4×800. Greenwich’s quartet of Lance Large, Chris Wint, Ryan Raybuck and Zane Nye won by just .02 seconds while Ludlowe’s senior lineup of Kabir Chavan, Nicholas Rullo, Ethan Lovallo and Colin Agotisi won the 4×800 going away. The Hatters stretched their lead to a significant margin by going 1-2 in the 1,000. Going and Hefele notched 18 points in that race for the champs. The pair accomplished the feat again in the 1,600 with Hefele winning in 4:29.61. Ridgefield’s Simon Jupp was a double winner Thursday as he swept the 600 (1:27.92) and 300 (36.15). Ludlowe’s Jackson Hemphill cleared 13-02 to win the pole vault while teammate Kabir Chavan won the 3,200 in 9:37.77. St. Joseph senior Myles Hall broke eight seconds in winning the 55 hurdles (7.89) while New Canaan senior Jack Conley won the shot put with a throw of 49-08.25. Team scores: 1. Danbury 112, 2. Staples 55, 3. McMahon 48, 4. Ludlowe 42, 5. Ridgefield 37, 6. New Canaan 29, 7. Greenwich 26, 8. Darien 24, 9. Norwalk 22, 10. Warde 20, 11. St. Joseph 19, 12. Wilton 16, 13. Trumbull 15. 4×200 relay: 1. Greenwich (Lance Large, Chris Wint, Ryan Raybuck, Zane Nye) 1:33.80; 2. Danbury (Malik Thomas, Malachi Lorick, Luka Santos, Shamar Catter) 1:33.82; 3. McMahon (Korey Morton, Elias Pardo, Sean Miller, Akeim Murphy) 1:34.57; 4. Norwalk (Olivier Cloiseau, Khalil Eason, Kyle Gordon, Malique Stevens) 1:34.89; 5. St. Joseph (Chris Coughlin, Myles Hall, Darren Warren, Jaden Shirden) 1:36.33; 6. Wilton (Jack Myers, Wooder Thoby, Tyler Daher, Liam Mannix) 1:36.94. 4×800 relay: 1. Ludlowe (Kabir Chavan, Nicholas Rullo, Ethan Lovallo, Colin Agostisi) 8:24.30; 2. Danbury (Dylan Rosemark, Rock Lamour, Brennan Amalfitano, Jack Watson) 8:28.49; 3. Ridgefield (Charles MacArthur, Ethan MacKenzie, Charles King, Simon Jupp) 8:30.79; 4. New Canaan (Allessandro Malagoli, Ajamo Carraby-Jones, Dylan Imbruce, Ryan Lytle) 8:34.67; 5. Greenwich (Alexander Kosyakov, Alexander Bein, Akash Molekudy, Aidan Brock) 8:34.80; 6. Trumbull (Chris Lepore, Tejas Kulkarni, Owen Hopwood, Joseph Gregory) 8:35.24. 55 hurdles: 1. Myles Hall (St. Joseph) 7.89; 2. Alexander Beiku (Danbury) 8.02; 3. Shay Fahsbender (Danbury) 8.30; 4. Samuel McDonough (Ridgefield) 8.34; 5. Anthony Hill (Greenwich) 8.38; 6. Charlie Golbourn (Wilton) 8.40. 55 dash: 1. Korey Morton (McMahon) 6.47 (meet record); 2. Malik Thomas (Danbury) 6.64; 3. Jaden Shirden (St. Joseph) 6.69; 4. Malique Stevens (Norwalk) 6.70; 5. Jaden Cazorla (Danbury) 6.71; 6. 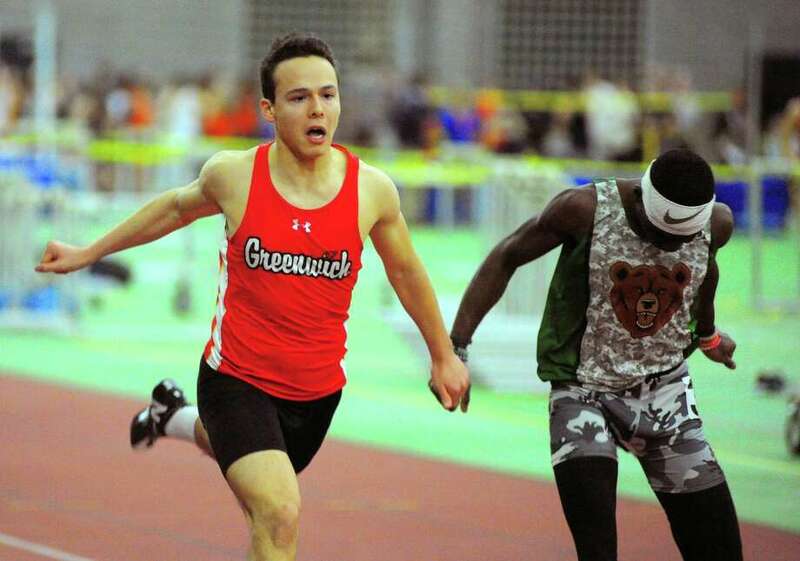 Ryan Raybuck (Greenwich) 6.72. 1000: 1. Malcolm Going (Danbury) 2:39.69; 2. Jacob Hefele (Danbury) 2:39.85; 3. Henry Haas (Staples) 2:40.07; 4. Nicholas Taubenheim (Staples) 2:41.80; 5. Colin Agostisi (Ludlowe) 2:44.24; 6. Ryan Muhlenberg (Warde) 2:44.82. 600: 1. Simon Jupp (Ridgefield) 1:27.92; 2. Frank Bonaddio (Norwalk) 1:28.38; 3. Gabriel Kwarteng (Danbury) 1:28.59; 4. (tie) Akeim Murphy (McMahon) and Nicholas Rullo (Ludlowe) 1:28.85; 6. James Kane (Ridgefield) 1:29.79. 1600: 1. Jacob Hefele (Danbury) 4:29.61; 2. Malcolm Going (Danbury) 4:30.15; 3. Luke Lurenz (Staples) 4:32.44; 4. Dylan Pomer (Warde) 4:33.12; 5. Morgan Fierro (Staples) 4:33.63; 6. Gregory Vogt (Warde) 4:36.45. 1600 sprint medley: 1. Staples (Aiden Rose, Casey McGeehan, George Lepska, Henry Haas) 3:46.85; 2. Danbury (Bernie DeLaCruz, Malachi Hopkins, Gabriel Kwarteng, Rock Lamour) 3:47.59; 3. Norwalk (Olivier Cloiseau, Kyle Gordon, Malique Stevens, Frank Bonaddio) 3:48.23; 4. Greenwich (Ryan Raybuck, Hunter Clark, Thomas Rouffiac, Stephen Burke) 3:48.56; 5. Darien (Tyler Herget, Nick Balenzano, Pierce Hoyda, Jacob Grimm) 3:54.38; 6. St. Joseph (Jaden Shirden, Myles Hall, Karl Bruce-Tagoe, Brian Melanson) 3:54.86. 300: 1. Simon Jupp (Ridgefield) 36.15; 2. Malik Thomas (Danbury) 36.67; 3. Jack Myers (Wilton) 36.68; 4. Malachi Lorick (Danbury) 36.93; 5. Jack Holly (Darien) 37.09; 6. Lance Large (Greenwich) 37.16. 3200: 1. Kabir Chavan (Ludlowe) 9:37.77; 2. Andrew Malling (New Canaan) 9:42.67; 3. Dylan Pomer (Warde) 9:52.11; 4. Morgan Fierro (Staples) 9:52.15; 5. Austin Hutchens (Warde) 9:52.21; 6. Teddy O’Kane (Staples) 9:57.79. 4×400 relay: 1. Danbury (Gabriel Kwarteng, Ryan Caldwell, Malcolm Going, Malachi Lorick) 3:34.65; 2. Darien (Pierce Hoyda, Andrew Donovan, Austin Dehmel, Jack Holly) 3:36.78; 3. Greenwich (Anthony Hill, Lance Large, Thomas Roouffiac, Zane Nye) 3:38.79; 4. Trumbull (Andy Spillane, Nigel Hayes, Zachary Seymour, Evan Seymour) 3:39.06. Long jump: 1. Justin Forde (McMahon) 23-4 (meet record); 2. Wooder Thoby (Wilton) 21-0; 3. Luke DeMato (Warde) 20-7.75; 4. Chet Ellis (Staples) 20-4; 5. Nick Balenzano (Darien) 20-2; 6. Troy Bardos (McMahon) 20-0. High jump: 1. Chet Ellis (Staples) 6-6 (tied meet record); 2. Justin Forde (McMahon) 6-4; 3. Ryan Eppley (Darien) 6-0; 4. Korey Morton (McMahon) J6-0; 5. John Peiser (New Canaan) 5-8; 6. Dillon Buongiorno (Ludlowe) J5-8.